Sigmund Freud had broad ambitions about what psychoanalysis could add to human thought. But Freutfs own writings have rarely been assessed within the perspective of political philosophy. Political theorists will find in the school Freud established a rich storehouse of ideas. For us to link up with what Freud was saying means to join in the great conversation about what the ends of the just society should be, as well as what a fully developed person might be like. Written more than twenty years ago, the central interpretive theses found in Freud: Political and Social Thought still ring true. 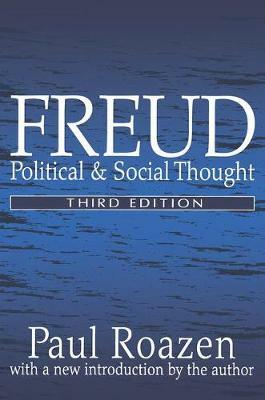 In his new introduction to this classic text, Paul Roazen contends that today, from the point of view of intellectual history, Freud looms as a subject in an even larger way than he did back in the 1960s. His thinking has impinged, for good or ill, on how we think about character and the nature of human impulses. Privacy itself has been affected, so much so that political candidates now feel free to use intimate material from private life for manipulative public purposes. Yet after all this time political scientists remain reluctant to entertain the need to explore the psychological dimension of all political events. Without reducing politics to psychoanalysis, or inflating psychological categories to embrace all of politics, Roazen provides an introductory look at the field of psychoanalysis. By bringing together the different disciplines of psychology and politics he breaks through parochialism. Roazen is no advocate for psychoanalysis, but believes that analysts have as much to learn from social science as the other way around. This volume is proof that at its best political theory has to be inherently interdisciplinary. As such, this volume will be of interest to intellectual historians, psychoanalysts, and political theorists.